There are six lineages within four subspecies of native trout that were once endemic to rivers in Colorado: The Yellowfin Cutthroat (Twin Lakes and Arkansas River Watershed), currently believed to be extinct; the Rio Grande Cutthroat in the San Luis Valley and New Mexico; the Greenback Cutthroat in the South Platte River Basin; and the Colorado River Cutthroat on the western slope comprised of 3 distinct lineages (San Juan, Gunnison/Colorado, and White/Yampa). Native Greenback Cutthroat species being released into the wild. Once prolific throughout the state, these populations of native fish have been significantly impacted by human actions such as logging, mining, and water infrastructure, as well as natural stressors such as competition from non-native trout, aquatic invasive species, and habitat fragmentation. Colorado Trout Unlimited and various TU chapters continue to work closely with our agency partners (CPW, USFS, USFWS, NPS, BLM, etc.) to protect and expand populations of Rio Grande, Colorado River, and Greenback Cutthroat. By working closely with land managers, other non-profit partners, private landowners, academic institutions, and communities across the state, we continue to implement on-the-ground projects that help to protect and restore habitat and populations of native trout. At one point greenbacks were thought to be extinct. Then they were mistaken for the Colorado River cutthroat. Explore the ongoing recovery process in the South Platte River Drainage and see how you can get involved! The Rio Grande Cutthroat can be found in high elevation streams and lakes of the Rio Grande, Canadian, and Pecos River drainages in Colorado and New Mexico, giving it the southern-most distribution of any form of Cutthroat Trout. The Colorado River cutthroat trout is designated as a species of special concern in Colorado, and significant resources have been dedicated to conservation of the subspecies. Restoration efforts on Rock Creek, credit Jim Rasmussen. The Flyathlon combines running, fishing and craft beer into an event and the outcome is improved habitat. Proceeds from the event go towards Colorado TU and the Western Native Trout Initiative for projects on native species research and reintroduction. During just one event in 2016, runners and participants raised over $24,000 that will all be put back into habitat and native trout. Zimmerman lake is the home to the first Greenback reintroduction. The greenbacks here are the basis and starting point for Greenback projects throughout the state. Each year, CPW biologists with help from CTU spawn the Greenbacks at Zimmerman to ensure the gene pool remains random and it improves future spawning and stocking. Mt. Shavano fish hatchery in Salida is where Greenbacks, and many other fish species, get their start. The hatchery is the birth place of the Greenbacks that were spawned at Zimmerman. 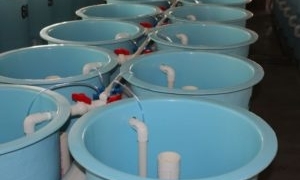 There are currently over 30,000 Greenbacks being raised in the hatchery that will one day be introduced into the wild. Tom Schneider is a guide along Clear Creek next to I-70 through the Front Range. Tom has a unique connection with the area and the native species that once, and will once again, called the water of Clear Creek “home.” Tom incorporates an education of native species and respect for the habitat in his guided tours. 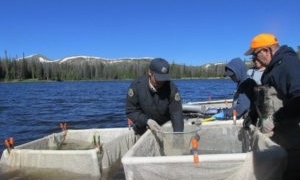 Image in banner shows native Greenback Cutthroat Trout being released into Fern Lake at Rocky Mountain National Park, Colorado.